It’s not every day you read an article on the front page of The New York Times at the same moment you are watching it unfold out your front window. After a blast in East Harlem earlier this month killed eight people, there has been a heightened scrutiny of the aging gas delivery system. For the last couple of weeks, Central Hudson workers have been sniffing around my block trying to pinpoint a leak. 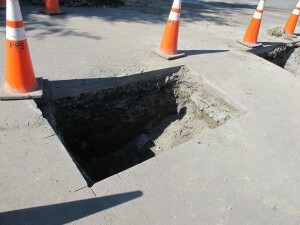 After a number of test drillings and readings in the street, they disappeared for a few days. But the smell came back and so did Central Hudson, in the middle of the night. 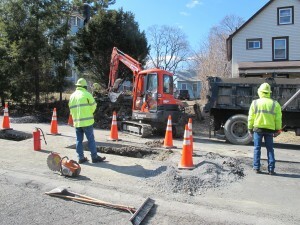 Today there was a full crew from Precision Pipeline Solutions, based in New Windsor, busy digging holes and replacing parts of the main street line and all of a neighbor’s connecting line. Two holes were dug before the junction from the main line was accessed. One of the Precision workers told me that a good portion of Beacon, and for that matter, most of the older towns in the Hudson Valley, consisted mostly of aging iron pipe, some that was 100 years old. 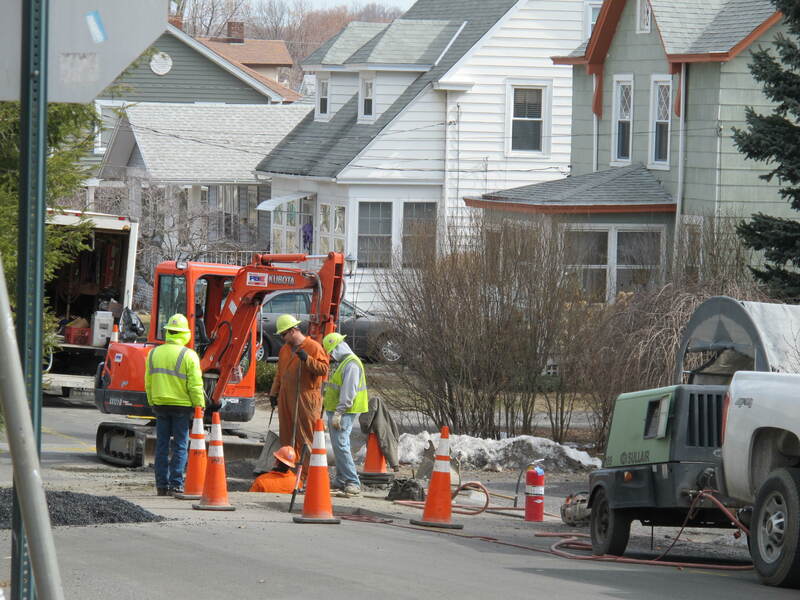 In addition to responding to suspected leaks, the gas company has plans to start replacing the iron with plastic pipe, a project that will no doubt take many years and cost a lot of money. I can only imagine how much the little adventure on my street that unfolded in the past few weeks ended up costing—and this was for service to a single customer. 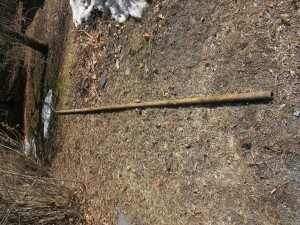 This is part of the pipe that went to my neighbor’s home. The Precision worker said the connectors on the main were in worse shape, but those had already been removed when I arrived with my camera. One problem that increases costs is a lack of good maps of the infrastructure hidden below the streets. The first attempt to find where the service pipe left the main was off by a bit, and another hole had to be excavated. 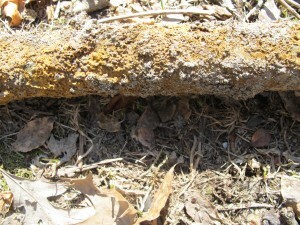 The same problem plagues repairs of water and sewer pipes. With the economy essentially flat-lining and energy costs creeping upward, the prospect of municipalities becoming flush enough to keep up with all the work that is needed on the various systems that supply us with the comforts of home is unlikely. In fact, it’s apparent that we are falling farther behind all the time at all levels, from national infrastructure to roads and sewers in the smallest burgs. The costs of repairing decaying infrastructure are paid in different ways—tax increases, new taxes like the energy tax, and increases in utility rates. But the bills are all sent to the same people: us. That’s why, while it may make sense for the City to encourage renovation and infill projects in the central business areas, encouraging large new development projects in our city when we can’t even afford to maintain what we already have seems shortsighted. After a certain point, the idea that adding more infrastructure will help keep our taxes low is really little more than a pyramid scheme. Large developments need to be looked at carefully for many reasons, including the impacts on infrastructure and services. For example, the proposed development at 248 Tioranda Avenue, according to the developer’s own accounting, is a break-even deal. In other words, the City of Beacon will pay out in maintenance and services the same amount it will receive in new tax revenue. When you factor in quality of life issues such as more traffic and condo-like rental buildings on the Fishkill Creek, how does Beacon and its citizens come out ahead? And what are the chances that the project, already at net zero, could slip into the red, whether at day one or year ten? 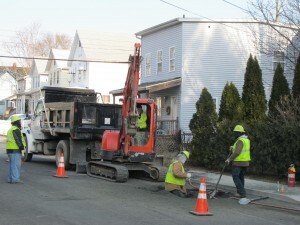 A different crew working on the north side of Main Street on Tuesday. I don’t think Beacon needs more gas. Prices are going up more than heating oil. I have heating oil, but I DO NOT use petroleum. I use Bio-Heat. No gas lines into the house and no leaks. And if my Bio-Heat were to leak, it’s just basically veggie oil, so you can just compost it. It is not toxic at all. So think of using a combo of bio-heat and solar heating and/or geothermal, you can forget about all those worries. The comment above is very close to being an ad, so proceed with caution. It also does not address the subject of the post, aging infrastructure and whether development is the answer to replacing it. “Bioheat” may be an option for those still using oil to heat their homes. But it’s only a temporary stopgap, and as oil prices continue to climb, Bioheating fuel, at no less than 80% oil, is not going to save homeowners money. In the end, it’s still burning an unrenewable resource. First of all, this is not an ad. I’ve been using bio for my home and car for the last 6 years and I’ve had no issues. It’s cheaper and cleaner. My comment was because we shouldn’t spend more money on fixing gas. More gas leads to more problems. Bioheat doesn’t blow up! Gas is no answer, it only leads to more money hungry gas companies. Maybe you won’t post my reply because YOU are an advocate for gas. Maybe YOU are an add for more gas in Beacon. heating fuel application, such as home heating oil equipment, commercial boilers, and diesel generators, without any modifications. What part of this is not renewable? While cars may run on pure biodiesel, a 20% blend with conventional oil is the limit for home heating, for various reasons, including higher freezing points and clogging the system with sludge. Home prices start to rise when demand outpaces inventory, which is happening right now in Beacon. It is unfortunate for people on fixed incomes and I recognize that, I don’t like my taxes going up either. But there is not much to do about rising values if people continue to want to move here and there are only a limited amount of houses for sale. This is a problem as old as taxes and I don’t have the answer to this one. The population of Beacon has grown about 12% since 2000 and also had a big increase in the early 50’s when around 1/3 of the single family residences in Beacon where built and through the early 60’s when, unfortunately, most of Fishkill Landing was destroyed in Urban Renewal. And it grew rapidly before that when the Villages where merged to form Beacon. All of this put strains on the infrastructure that had to be addressed at that time. We built new reservoirs, we built new sewage treatment plants, we built new water treatment plants, we put in new sewer/storm/water lines, we built roads, we added police officers, etc. We are in one of those times now with the current increase and resurgence of our city but luckily for us we really only need to repair the old infrastructure in most cases. I don’t think development is a solution for today’s societal problems, but it is a major part of what has allowed businesses to survive in this town and will be a part of the growth and sustainability of the economy in Beacon. I think this can be evidenced on a small scale from the Roundhouse. Go into Dogwood after a wedding and you’ll find a few dozen people there from the wedding that would not have been there otherwise. Local restaurants see an increase in business from those weddings and hotel guests. I have been to numerous business functions at the Roundhouse with people from around Dutchess County and most are have not been to Beacon in 20 years. They are always amazed at what this town has become from when we were growing up. Another example, and probably with the biggest impact, would be Dia. Without that development (it is commercial development even though it is a museum) this city would not be where it is today. Both of these certainly put additional strain on city infrastructure from the roads to the sidewalks to the storm, sewer and water. But both have played a major role in getting the city to where it is now from where we were in the 80’s. As far as rental residential development…almost all of the apartments on Main Street where falling apart, abandoned, or slum apartments 20-30 years ago. The re-development of these buildings and the repair/renovations of these apartments are an important part of what Beacon’s Main Street is today. Again, all of this put additional strain on the sewage, water, storm, and highway systems. ANY development will have increased cost to the city infrastructure including rental space on Main St. We also handle much of the Sewage from Fishkill here in Beacon so increased development over there also affects us. But in the long term getting these properties back on the tax roll will be positive for Beacon…it may cost us a few tens or hundreds of thousands to rebuild a sewer line that needs to be replaced anyways (we’re just accelerating the timeline) but the benefits include at least part of that cost being offset by taxes and additional population to shop on Main Street supporting local business and generating sales tax. It’s also important to note that most of the newer shops on Main Street appeal mainly to a specific segment of the overall population of Beacon, I would estimate less than half. We also face FAR increased competition from stores like Walmart, Home Depot, and from online stores. This is all competition that did not exist when Main Street was thriving in the past, people did not have the choice to go to Walmart and buy groceries or other items that used to be only at individual stores on Main Street. So to say that the somewhat steady population of 12,000-15,000 people in Beacon has supported Main Street in the past is not really applicable in today’s world of ecommerce and big box stores. The development, both commercial and residential, will help businesses in the town and will provide additional tax revenue that we did not previously have. It in certainly not the answer to all our problems but increasing population density will help address certain problems. Also let me be clear…I am not blindly for all development. I fought very loudly against the TOD and I am a pretty big supporter of open space. What scenic Hudson did to save the Mountain from development is to be commended on so many levels…but the re-construction/construction of the old un-used industrial sites in Beacon, that are along or very close to our central business district, and would otherwise remain vacant, contaminated, or rot apart is something I support as good for the City. I would disagree, I think the thing to remember is that this infrastructure has to be repaired one way or another…new development or not. If we can increase the tax revenue by re-developing these abandoned or vacant areas we can at least offset the cost of the infrastructure repairs a bit. And in the long term that money will be brought back in via tax revenue in more ways than one (see below). It’s also important to get these projects going in order to increase density in Beacon. We have a lot of business that are opening and frankly not enough population (at least those willing to spend) to support all the businesses. By building the projects like 1 East Main, The Beacon Salvage Yard, Tioronda Ave, Beacon Hip Lofts, etc, we will be increasing the population density of Beacon and bringing in more people who will support the businesses on Main Street. You can build the central business district (main street) all you want but if there is not enough density of people to support those business nothing will change. The infrastructure in Beacon needs to be upgraded regardless of these new development projects. If we can offset some of that cost we should and at the same time bring more people to Beacon to support the local businesses. If this trend continues, property values will continue to rise (they already are in Beacon) and tax revenue will again increase…and thus allowing more revenue to repair the infrastructure. Just a disclaimer…I have owned two businesses in Beacon, one is closed now and the other is a business that involves me in many of these development projects as a design/planning/mapping professional. I am also a resident of Beacon (native to then Hudson Valley) who has witnessed the full change of Beacon from a place that we where told never to go to as kids because of the crime to the city that it is today. Thanks for your thoughtful response, Tom. I would point out several issues. The developer at Tioranda already acknowledges that the projects costs to the city vs. the tax revenues expected will be a net zero, so there is little chance of offsetting our infrastructure costs. As far as property values rising and therefor generating higher taxes, we’ve fallen on that double-edged sword before. Many long-time Beaconites on fixed incomes suffer when this happens. Beacon’s population is right at about historic levels. At one time, when we actually had a local economy, Main Street businesses were doing fine with a population equivalent to today’s. Building a bunch of rental units all at once may increase density, but I don’t think it offers a long-term solution. Show me examples of large developments by single developers in Beacon or elsewhere in the Hudson Valley that have been the solution to the problems we face as a society today. The Beacon Free Press has an interesting article in today’s issue, “Electricity Costs Shocking” I guess that’s a funny headline, but higher costs for energy should come as no surprise. Wigwam will continue to examine these infrastructure issues and what they might portend for our future. We’ve been working on a post about our bridges. Look for that one by the end of the week.